Fabulous food, glitzy costumes and great silent auction items highlighted the LBJ Museum of San Marcos’s fourth annual ‘60s Night fundraiser. The food – contributed by Café on the Square, Cool Mint Café, H-E-B, museum board members and Saints and Sinners – reflected both specialties made popular in the 1960s and samples of the best tastes’ of food available in San Marcos. Costume contest winners received certificates in men’s and women’s divisions. Winners in the men’s division were Anthony Romano, all spiffed up for “Breakfast at Tiffany’s,” first place; Ralph Garcia, a Clark Kent/Superman want-a-be, second; Scott Mitchell, a hippy for sure, third; and Gabriel Gomez, dressed in fatigues, honorable mention. In the women’s division, Elsie Romano continued her husband’s “Breakfast at Tiffany’s” look to win first place. Second went to Laurel Crittenden, who was dressed for a night out, while third place winner Diana Baker sported a bright day-time top with a festive headband. From a wine tour for four contributed by board member Linda Rodriguez to fine dining gift certificates provided by local businesses, the variety of auction items was great, Mihalkanin noted. The Chick-Fil-A cow helped Ed Mihalkanin hand out prizes to the dozen of winners of the Trivia Contests. 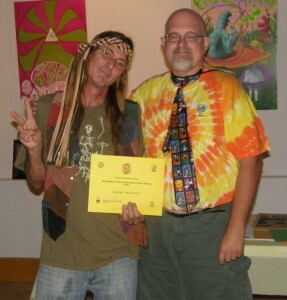 THANKS, SCOTT – Scott Mitchell (left) may have placed third in the men’s division of the LBJ Museum’s ‘60s Night costume contest Friday night, but his posters and album covers were first rate as part of the exhibit featured during the fundraiser. 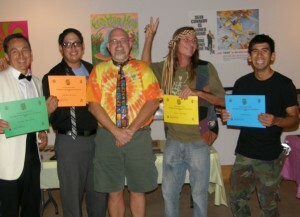 ‘60s Night at the LBJ Museum – And the winners in the men’s division of the ‘60s Night costume contest at the LBJ Museum of San Marcos were (left to right) Anthony Romano, 1st place; Ralph Garcia, 2nd place, Museum Board President Ed Mihalkanin (dressed for the part but not competing); Scott Mitchell, 3rd place; and Gabriel Gomez, honorable mention. 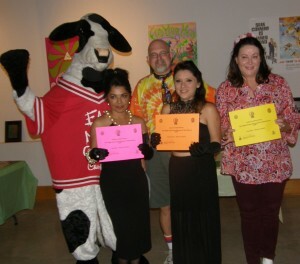 WOMEN’S DIVISION COSTUME WINNERS – With LBJ Museum of San Marcos Board President Ed Mihalkanin (center) getting a little help from the Chick-Fil-A cow, certificates were presented to the top ‘60s costume contest winners in the women’s division Friday night at the museum’s fourth annual ‘60s night fundraiser. Winners were Elsie Romano, 1st; Laurel Crittenden, 2nd; and Diana Baker, 3rd. 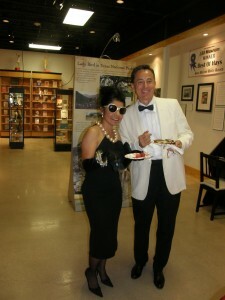 BEST DRESSED PAIR – Claiming first place in women’s and men’s divisions of the LBJ Museum’s ‘60s Night costume contest were Elsie and Anthony Romano. Who could argue with their selection?